Before moving to Pasadena, George and I were living on the Upper West Side of Manhattan. We were only Upper West Siders for a brief time – George lived in our UWS apartment for five months before moving to California; I was there for eight months. It was a short living stint, but a very memorable one. Our apartment was just north of the tony Upper West Side, but provided ideal access to Central Park, relatively inexpensive parking (inexpensive for NYC), the express 2/3 train and, last but not least, good restaurants. There was a Mediterranean restaurant a few blocks away on Amsterdam, a small bistro-style restaurant that almost had no presence – meaning, you could walk by it and not notice it was there. But inside, the restaurant was warm and inviting – a sort of clean, well-lighted place, and almost had the ambiance of eating in someone’s home. The menu was limited – a few fresh salads and signature starters like humus and Babaghanoush, and for entrees, a few tangine dishes and traditional kabob combinations. The restaurant’s lamb kabobs were really quite good and I found myself thinking about them recently. Before long, my thoughts turned into a craving for lamb kabobs, which then lead to NYC nostalgia, which then became how can I satisfy this craving, which finally lead to how can I duplicate those memorable lamb kabobs from the Upper West Side? Not really knowing all that much about the seasonings the restaurant used on their kabobs, I decided to keep mine simple as I really wanted to enjoy the lamb’s flavor and tenderness. I bought some good quality lamb from my local butcher, cubed it myself and seasoned it simply with a little extra-virgin olive oil, salt and pepper. I skewered the lamb with fresh red bell pepper, red onions and cherry tomatoes and grilled them until the meat was about medium in temperature. 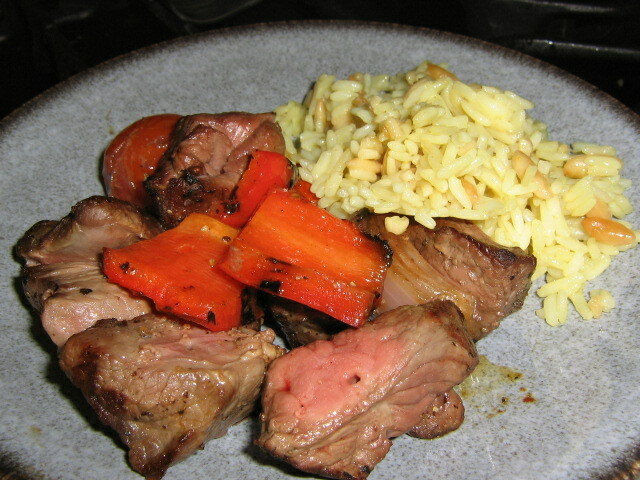 The simplicity of the seasoning really accentuated the lamb and the grilled vegetables married perfectly with it. To round out our Mediterranean meal, I made a quick Greek yogurt dipping sauce that couldn’t have been easier to make and tastier to eat! By combining a cup of Greek yogurt, diced cucumber, a bit of dill and surprisingly, a few dashes of cumin, the dipping sauce was the perfect complement to the lamb kabobs and brought the memories and flavors of our old Upper West Side neighborhood to our Pasadena living room! This entry was posted on November 14, 2008 at 1:20 am and is filed under Recipe Ideas. You can follow any responses to this entry through the RSS 2.0 feed. You can leave a response, or trackback from your own site.